When I leave the house, I always make sure I have at least one snack in my handbag. Quite often, this snack is what I like to call an ‘emergency muesli bar’. You’ll find it nestled somewhere in the bottom of my bag – to be consumed only in emergencies! I must say, when I have been caught out with nothing ‘Steph-friendly’ to eat, these bars have saved me time and time again. Although super convenient in times of need, there aren’t many packaged muesli bars I can trust to be completely FODMAP friendly. Too much dried fruit. Honey. Wheat. Apple juice concentrate. Barley. So for me, home-made is the way to go. 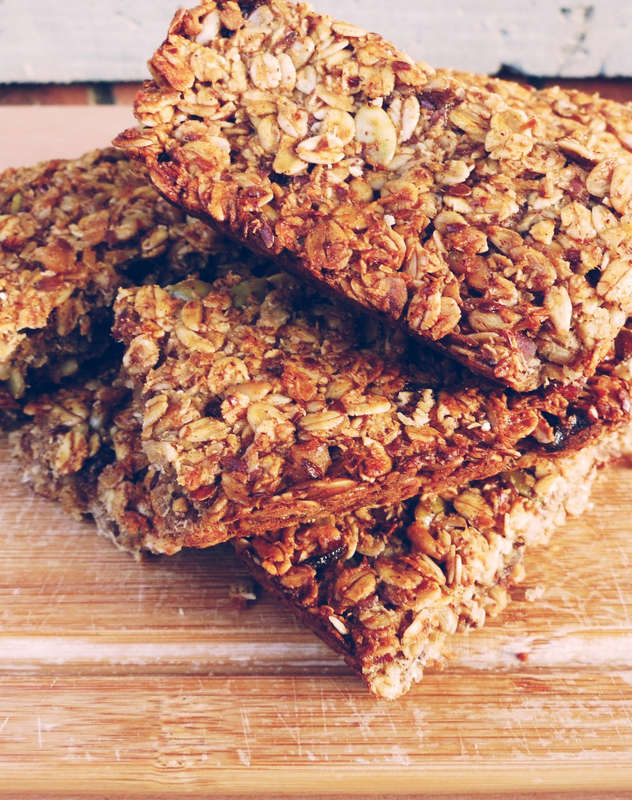 These muesli bars are simple, made with healthy ingredients, free of refined sugar and excess fructose, and you can be sure they’re full of goodness. Keep them in an airtight container and you’ll have fresh muesli bars for at least a week. They probably won’t last that long though because they’re too good just for emergencies. Preheat oven to 180°C and prepare a rectangle or square (8x8inch) baking dish with baking paper. Combine all dry ingredients in a large bowl. Lightly whisk together eggs, vanilla, oil and syrup in a small bowl, then stir this through the dry ingredients. Chop up dates and place in small bowl with the hot water and allow to soften. Add the dates to the mixture, stirring til all combined. Firmly press mixture into the lined baking tray. Bake for 30 minutes, or until golden brown. These look delicious and I can't wait to try them however I need to make them nut free so I can put them in my son's school lunch. What could I use to substitute for the LSA mix? The nuts I usually add in more seeds. Thanks so much, it helps a lot. In Portuguese is Tâmaras. Hi Stephanie. I am Portuguese and i am always looking for low fodmap recipes because in Portugal nobody knows this diet.I'm very pleased to find "you". I need your help because i can not find the right word in Portuguese to the ingredient "date". I can't find translation. I have searched a LONG time for a fodmap friendly muesli bar that stays together and ticks all my boxes. Finally. Thank you thank you. Doing a dance! I've just popped batch of these in the oven and can't wait to try them! Thanks for stopping by! Sorry, I have not tried this recipe with a substitute for oats so I am not sure. But if you do try and it works out, please do let me know!! Could you use quinoa flakes or puffed quinoa instead of the oats, do you think, for people who can't tolerate oats? Absolutely, we don't want that! Thanks for your kind words Marianne, I'm glad you stumbled across FLK too and hope you find it helpful :) enjoy! Dates are a tricky one as I've heard this a few times before. But you'll be pleased to learn that dates are actually suitable in small amounts for fructose malabsorbers! Yes, dates do contain a lot of fructose, but as with all other fructose friendly fruits, dates also contain a higher amount of glucose, which means we are able to digest them. I follow the low-fodmap diet and learnt this through the guidelines I received at a Sue Shepard dietician session (Melbourne, Aust based). It labels dates as 'suitable dried fruit in small amounts' along with sultanas, raisins, cranberries, etc. I'd be happy to send you a scanned copy of this sheet if you're interested! ?